Hominin skeletal remains from the Dinaledi Chamber, South Africa, represent a minimum of 15 individuals of the extinct species Homo naledi. We examined the dental material from this sample in order to assess the life-history stages of individuals in the sample, in particular to determine the minimum number of individuals in the sample as a whole, and within each of six age classes. We found evidence of individuals within every age class: infant, early juvenile, late juvenile, subadult, young adult and old adult. The Dinaledi Chamber sample is notable in comparison to other samples of human, chimpanzee and fossil hominins in that it has a relatively high representation of juvenile remains, as compared to infants and adults. With 15 individuals, the sample size presented by the Dinaledi dental material is too small to test the hypothesis of attritional versus catastrophic accumulation. The data here provide a basis for further investigation of individual associations within this commingled assemblage, and provide an important comparative data set as a basis for the consideration of life history in H. naledi and other extinct hominin populations. 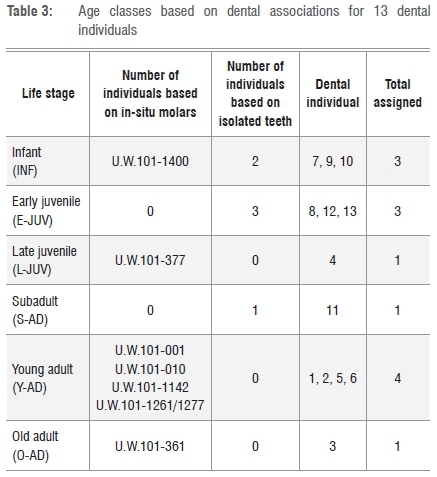 • We identified a minimum number individuals so far recovered in the assemblage and document the use of molar eruptions as biomarkers of life-history stages to sort the individuals into age classes. • We provide a demographic profile of individuals from the chamber and establish a comparative data set for life history in extinct hominin populations. The evolution of life history is fundamentally important to many of the anatomical and behavioural changes in human evolution, yet understanding the age structure of ancient hominin populations is challenging. The fossil evidence for human evolution is fragmentary, and most fossil hominin sites represent the remains of single individuals. Only a few sites preserve remains of large numbers of hominin individuals. Some of these sites, such as Sterkfontein and Swartkrans, reflect the accumulation of individuals by heterogeneous processes over very extended ranges of time. Such time-averaged assemblages - like multiple occurrences of single, isolated individuals - have limited utility for understanding the age structure and other demographic aspects of ancient populations. A mere handful of fossil assemblages may represent individuals drawn from a comparatively narrow interval of time, or even from single ancient groups, such as the Hadar A.L.333 locality, the Sima de los Huesos, and the El Sidrón assemblage. The comparative context for understanding the age structure at death in ancient hominins must be built on such fossil assemblages. However, the mortality events and subsequent taphonomic processes that formed these assemblages may exert unique biases upon them. These matters can be understood only by close comparison of such assemblages and their taphonomic circumstances. The Dinaledi assemblage presents an uncommon opportunity to examine a fossil species at the population-level perspective. We have undertaken a preliminary study of the dental remains from this assemblage to assess them as biomarkers of life-history stages of these hominins. The basic assessment includes an estimation of the minimum number of individuals (MNI) and the number of individuals that can be confidently attributed to age classes, enabling a demographic profile of the assemblage. We compared the finds to mortality patterns in living groups and to other hominin fossil assemblages from the Plio-Pleistocene, establishing a solid basis for future comparative work. A total of 190 teeth or partial teeth from the Dinaledi Chamber assemblage, recovered during excavations in 2013 and 2014, were used in the present study. Of these teeth, 60 are in situ within seven partial mandibles and one partial maxilla. The remaining teeth in the assemblage were isolated and include 16 specimens that are isolated roots or crown fragments, which provide relatively little evidence for assessment of MNI or age class. The MNI and age classes represented in a commingled dental assemblage are interrelated with each other. Two isolated molars that clearly represent different life-history stages (i.e. a highly worn M3 and an unworn M2) cannot represent a single individual, and so assessing age is fundamental to testing the number of individuals represented, and vice versa. We therefore proceeded to establish conservatively how many individuals the teeth could represent, erring in all cases toward a minimal number; the teeth may represent more individuals and future excavations may test this assessment. 6. Old adult, all fully erupted, wear well into dentin on M2 or sufficient to obliterate most occlusal detail on M3 (O-AD). 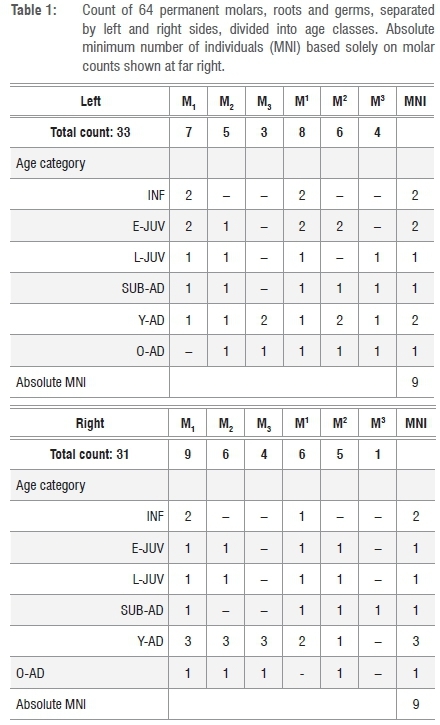 By using a simple count of total molar teeth by type and side, not considering in-situ placement, stage of development or wear, an absolute minimum of nine individuals was identified (Table 1). In this fossil assemblage, one complete mandible, six partial hemi-mandibles and one hemi-maxilla, with a total of 18 molars in position, were recovered from the Dinaledi Chamber14 (Table 2). Given duplication of tooth type, side and wear, and different stages of permanent tooth eruptions, each of the seven mandibular specimens represent a separate individual. The left partial mandible U.W.101-1400 has only deciduous teeth (canine and molars) with an M1 crown near completion in the crypt (unerupted), assigned as INF (Figure 1a). The right partial mandible U.W.101-377 contains a permanent canine, premolars and first and second molars, but the canine is only partially erupted, and the second molar erupted but not quite into full occlusion. We assigned this L-JUV (Figure 1b). Mandible U.W.101-1261 (Figure 1c) and associated partial maxilla U.W.101-1277 have fully erupted molar teeth with moderate wear, assigned here as a Y-AD. Of the remaining four adult partial mandibles, only U.W.101-361 exhibited heavy attrition on the left second and third molars. We assigned this specimen as O-AD. (Figure 1d). Mandible U.W.101-1261 articulates with partial maxilla U.W.101-1277. These two elements are both part of DH1, the holotype specimen of H. naledi1, and they provide a complete representation of all mandibular and maxillary tooth classes for H. naledi. 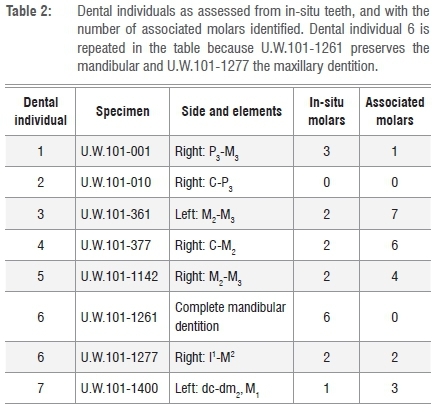 We relied first upon these in-situ dentitions to identify permanent molar types (M1, M2, M3), and then began the assessment of MNI on the remaining 46 isolated molar teeth. We fine-tuned the MNI by associating molar remains using standard approaches based on matching occlusal and interproximal contact facets, identifying antimeres, and identifying comparable stages of tooth development and attrition. This method follows previous work on the Krapina Neanderthal dental sample15, which in turn modified an approach developed for MNI assessment on the Zhoukoudian Homo erectus dental sample16. Building from the mandibular evidence, we examined the isolated teeth in the collection to identify possible antimeres of teeth in mandibles, possible interproximal facet matches with teeth adjacent to teeth in mandibles and maxillary post-canine teeth that occlude well and match the wear stages of teeth present in mandibles. Using these methods, we identified 23 additional molars, roots and germs that refit or are otherwise consistent with six of the dental individuals identified from mandibles. These dentitions comprise a total of 41 molar associations. We could not attribute any isolated molars to U.W.101-010, a partial mandible with only moderately worn anterior teeth, based on developmental stage. • Dental individual 12 to which we attribute 4 molars: 3- M1; 1- M2: unerupted, which we assign as E-JUV. These additional five individuals increased the MNI to 12. Anterior teeth. The study of the molars left unanswered whether the anterior teeth could be associated with individuals as identified from molars. We therefore continued by asking whether anterior teeth could be conservatively included within the existing hypothetical molar associations, or whether any inconsistencies required the addition of more individuals to the MNI count. We could accommodate all anterior teeth into this MNI of 12 dental individuals, except in three instances, in which anterior teeth presented duplications beyond the number of individuals identified from molars within an age class. Thus, three additional individuals must be present in the collection because of the duplication of anterior teeth. One of these individuals is clearly identifiable to age class, a third E-JUV, based on a left lower deciduous canine (U.W.101-824). Given the canine's stage of development and wear, the individual is older than the infants identified in the collection and more akin to an early juvenile. However, the canine cannot belong to the existing two E-JUV already identified because one already has an associated mandibular left deciduous canine, and the other has considerably less tooth wear than is consistent with U.W.101-824. A 14th individual is represented by a single upper left canine (U.W.101-347). There are 13 fully formed adult canine teeth (6 lower and 7 upper) in the assemblage. However, based on the differences in wear, left/right and size differences, this tooth represents an extra canine that does not fit with any of the five adults represented by partial mandibles, although it is consistent with adult life-history stage. A 15th individual is recognised for MNI purposes based on three adult incisors consistent with each other on the bases of minimal wear and appearance. These incisors belong to a juvenile or subadult individual. However, the incisors cannot be associated with the existing individuals in any E-JUV, L-JUV or S-AD age class based on the inconsistent stage of associated tooth wear. We have numbered the dental individuals for convenience of analysis and discussion but consider each of these to be hypothetical. As such, future work may change their composition or provide evidence that additional individuals may be represented. All the Dinaledi hominin remains are curated at the University of the Witwatersrand, and access to original material, scans and records is by application to the curator. The Dinaledi assemblage may be one of the most representative of a life-stage collection for Homo2817, despite the fact that the current collection is as yet a sub-set of the total assemblage and more materials will become available from excavation. At the few fossil hominin sites with multiple immature finds, dentition is relied upon to refine the categories beyond immature and adult, and to calculate the MNI.17-19 We compared the representation of broad age categories against those found at these other hominin fossil sites and within age-at-death distributions of contemporary human and wild chimpanzee populations, thereby investigating the palaeodemographic implications of the assemblage. We were able to identify a minimum number of 15 individuals in the Dinaledi Chamber, and provide an age class assessment for 13 of them (Table 3). The immature fall mostly within the INF (n=3) and E-JUV (n=3) age classes; the adults are predominantly Y-AD (n=4) with only a single O-AD by this classification. For two individuals that are present in the MNI, we cannot be confident about the age class because of the lack of associated molars; one is adult but cannot be confidently assigned to either the Y-AD or O-AD class, and the other is immature. This classification results in nine immature and six adult individuals. The quantification of MNI and age class attribution for the dental sample from the Dinaledi Chamber allows this sample to be placed into a comparative context. This classification provides a basis for examining the possible relations of dental with postcranial remains within the sample, and further provides data relevant to understanding the formation of the site and disaggregation of remains of some individuals within it. At the same time, this classification itself must to some extent reflect the limited amount of excavation of the Dinaledi Chamber, as well as the events leading to preservation of the fossils, both of which may lead to biases in the composition of the dental sample. We consider each of these issues. Remains within the Dinaledi Chamber have been recovered both from the surface of the chamber (approximately 20 m2), and from an excavation area of approximately 0.8 m2 of the deposit. The majority of fossil specimens, including teeth (~80%), derive from this excavation area. Despite the density of bone material in this excavation field, it is unclear if the material in this area is an unbiased representation of the total assemblage. Abundant fossil remains are still within the chamber, although the relative density of remains in the deposit compared with that of the present excavation is unknown. The small excavation sample and targeted excavation area may bias the representation of individuals. The 2013-2014 excavation area produced immature and adult remains from multiple individuals. The surface collection recovered a smaller number of specimens, but these specimens also represent multiple individuals. Some individuals in the present collection have an impressively complete dental representation, and others are represented provisionally by only a small number of teeth - in the extreme by only a single tooth. This distribution suggests that while further excavation may recover more parts of the same individuals, it is also highly likely that individuals remain in the deposit that have not yet been represented within our sample. At the very least, our dental individuals 14 and 15, which are insufficiently represented to assess age class with confidence, might be resolved with a few additional dental remains. The present MNI is more likely to underrepresent adults than immature individuals because differences in developmental age between isolated deciduous and recently erupted permanent teeth are more apparent than differences in age among adults with substantial occlusal wear. Thus, permanent teeth of adults are more difficult to eliminate from possible associations for MNI purposes. In some other sites, spatial proximity of specimens can assist in the assessment of MNI. That is, it is sometimes possible to use the location of remains to help identify individuals. However, spatial proximity is not particularly insightful in the Dinaledi Chamber assemblage, in part because of the unusually dense clustering of the remains, and in part because it is evident that some of the deposit has been reworked after the initial deposition of the remains.2,3 Some parts of the deposit preserve articulated remains, such as parts of a lower limb, hand and foot remains, some thoracic elements and dentition in situ. The majority of elements (94%) were recovered out of articulation, with fragmentary elements from different individuals intermingled with each other. For example, a group of teeth (beginning with U.W.101-1002, including lower and upper molars, a premolar, incisors and a canine) were found in close association during recovery in the excavation pit. However, based on the different stages of dental development, the teeth are clearly from different age classes, and represent at least three separate immature individuals. Because of the unusual context of the hominin remains, it is potentially of great interest to know whether they represent attritional mortality or whether they might have resulted from a catastrophic mortality event. Assessing palaeodemographic parameters in archaeological and palaeontological collections remains challenging.20,21 Thirteen fossil individuals of known life stage from one species at one site is a relatively large number compared to most assemblages, but is nonetheless small in a statistical sense. We considered whether the high fraction of infants and early juveniles (6 out of 13) might indicate something about the nature of the deposit that distinguishes the assemblage as attritional mortality or catastrophic mortality. However, a sample size of 13 individuals is not sufficient to statistically distinguish these distributions from each other even under the assumption of a stable demographic profile. The reality of fluctuating population size and group composition in a natural population means that substantially more than 50 individuals would be required to separate hypotheses of mortality profiles at the 95% confidence level. For this reason, we view it as appropriate to consider only general aspects of the life-stage pattern of death distributions for H. naledi. With nine immature and six adult individuals, the fraction of immature remains in the present Dinaledi Chamber sample can be compared generally to the mortality distributions observed in living foraging groups. Again, we distinguish here between immature, which includes all individuals prior to adulthood, and more narrow life-history stages of infant, juvenile and subadult. The Hadza have immature mortality rates of 65.0%, with most of these deaths in the infant life-history stage, and 12.3% as juveniles.22 In Dobe !Kung, immature deaths are less frequent at 40.5%, with a lower juvenile mortality at 7.4%.23 Chimpanzee mortality rates at two African sites range between 30% and 60% during infancy, depending on environmental conditions and diet, whereas juvenile mortality is typically lower at 15-27%.24-26 The relatively high representation of juvenile individuals in the Dinaledi Chamber sample is interesting, considering the lower representivity in mortality distributions of modern human and chimpanzee populations. The A.L.333 Australopithecus afarensis locality at Hadar, Ethiopia, may be more comparable with Dinaledi in representing a limited time horizon, and includes at least 17 individuals - 9 adults and a minimum of 8 immature individuals.30-32 The majority of the immature individuals compare to our INF category based on deciduous dentition with no permanent teeth, and are 'very young'31. This high fraction of infants is similar to the age-at-death distributions noted above for modern humans and chimpanzees. The taphonomic conditions at this Hadar site support death by attrition, such as a predator accumulation, and not a high-energy, catastrophic event such as a flash flood18, although deliberate body accumulation by hominins has also been suggested for this assemblage33. Dinaledi Chamber contrasts with this sample in the higher number of H. naledi juveniles (E-JUV and L-JUV) compared to the Hadar A.L.333 site. In contrast to the Pliocene A.L.333 fossil assemblage, several samples of Middle to Late Pleistocene Homo represent contexts in which the hominins were clearly the principal accumulating agents.2 Sima de los Huesos (SdH), Spain, has been characterised as an intentional disposal site dated at 430 000 kya.17,34 Like the Dinaledi assemblage, the 28 individuals at SdH are morphologically homogeneous and confined to one horizon, findings that support the assemblage represent one population.17,34 The age-at-death distribution of the SdH hominins has a high fraction of immature remains - older juveniles and subadults, with a much lower proportion of infants and early juveniles than Dinaledi, a difference that is unlikely to be due to taphonomic processes at that site.17 Peri-mortem injury suggests interpersonal violence attributed to the assemblage at SdH.35 The 49 kya El Sidrón Neanderthal site is an assemblage of at least 13 intermingled individuals that present evidence of cannibalism.19,36 There, one infant, two juveniles, three subadults and seven adults are represented. Dinaledi preserves more infant and juvenile remains, but the small sample size does not give rise to any statistically significant difference. These descriptive comparisons provide some additional context, but do not by themselves provide any strong test of hypotheses about the formation processes of the Dinaledi assemblage.37-39 The deposition of at least 15 individuals with particularly high proportions of infants and young juveniles establishes Dinaledi as unusual compared to other fossil hominin assemblages. Remains of three additional H. naledi individuals (two adults and one immature) have been recovered from the Lesedi Chamber, a separate region inside the Rising Star Cave system approximately 60 m NNE from the Dinaledi Chamber.39,40 The context of the Lesedi Chamber remains is similar to that within the Dinaledi Chamber, and a similar depositional process is a possible explanation, although the age of the Lesedi Chamber sample remains unknown.40 We have not here considered these individuals within the age classification of the Dinaledi Chamber hominins, and they will require additional study. If these remains represent the same or a similar population, a second assemblage within the Rising Star Cave system gives rise to the possibility that additional skeletal and dental material will be discovered. If so, a larger sample of hominin remains may in the future allow formal statistical and demographic analyses that are not yet possible on the sample of individuals from the Dinaledi Chamber. We thank Zach Cofran for input during the Rising Star Workshop and three anonymous reviewers whose comments strengthened the paper. We also thank the National Geographic Society and the South African National Research Foundation for particularly significant funding of the discovery, recovery and analysis of this material. Further funding was provided by the University of Wisconsin-Madison. We thank the University of the Witwatersrand and the Evolutionary Studies Institute as well as the South African National Centre of Excellence in PalaeoSciences for curating the material and hosting the authors while studying the material, and Lee Berger for the opportunities to work on the fossil collections. We thank the South African Heritage Resource Agency for the necessary permits to work on the Rising Star site; the Jacobs family and Lee R. Berger Foundation for Exploration for granting access; our exploration team comprising Pedro Boshoff, Rick Hunter and Steve Tucker; excavators K. Lindsay Eaves, Marina Elliot, Elen Feuerriegel, Alia Gurtov, Hannah Morris and Becca Peixotto; and Wilma Lawrence, Bonita De Klerk, Natasha Barbolini, Merrill Vanderwalt and Justin Mukanku for their assistance during all phases of the project. We appreciate the collegial dialogue and discussion with participants during the Rising Star Workshop. We thank Carol Underwood for help on the figure. D.R.B. and J.H. evaluated age classes of dental remains and conducted comparative work; D.R.B, J.H., B.B. and N.C. wrote the paper, added comparative data, oversaw the research and edited the paper. All authors discussed content and results, and contributed to the manuscript.